FTC Disclaimer: **I received the product(s) mentioned in this post for free from American Standard. These are not affiliate links, and I will not receive compensation if you purchase from them. The upstairs at Flip 4 has two bathrooms, but the hall bathroom is the one that will get the most use. It will also be the one company sees the most when they’re over. So I wanted that space to be highly functional but pack a design punch. 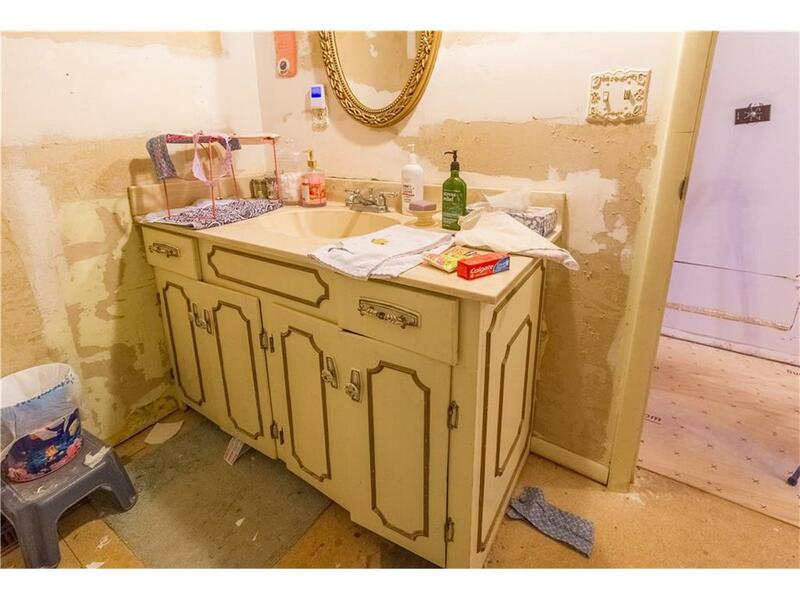 It’s not a huge bathroom, and the layout is functional. But it was soooo ugly before I got my hands on it. To state the obvious, it wasn’t even finished. The subfloor was rotted due to a leaky toilet that had never been fixed. There was no texture or paint on the drywall. The shower hardware wasn’t even fully attached. There was no flooring whatsoever. It was a disaster. But it had good bones! I mean the bones were really dirty and hidden, but they were there! I could see them! As with every flip, I always try to salvage what I can. I do that mainly for budget, but I try to keep the integrity of a space. 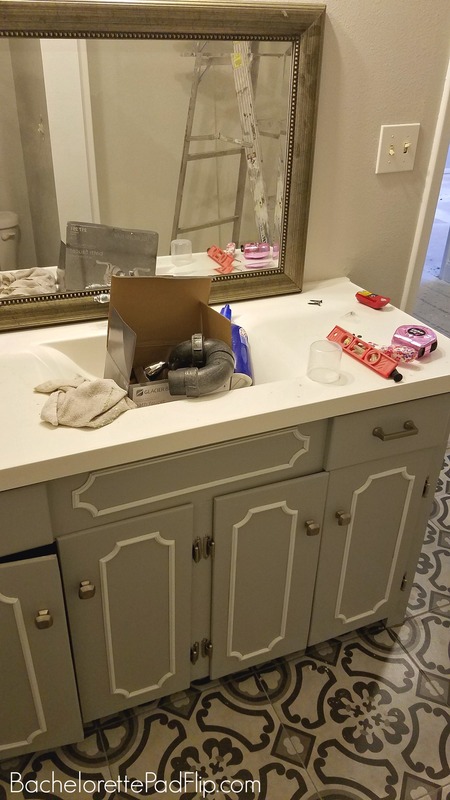 In doing that, I kept the vanity cabinet, toilet, and shower combo insert. I ditched just about everything else. From the dated countertop, plastic mirror, and hanging lights, there was a lot that needed help in this little room. But that vanity with those details? That just needed a face lift! Since this was a smaller room, but yet a high traffic room, I knew I wanted to add some bold design. I typically shy away from bold design choices in larger spaces because they can be so overwhelming. I wanted to keep most of this room very neutral except for the floor. 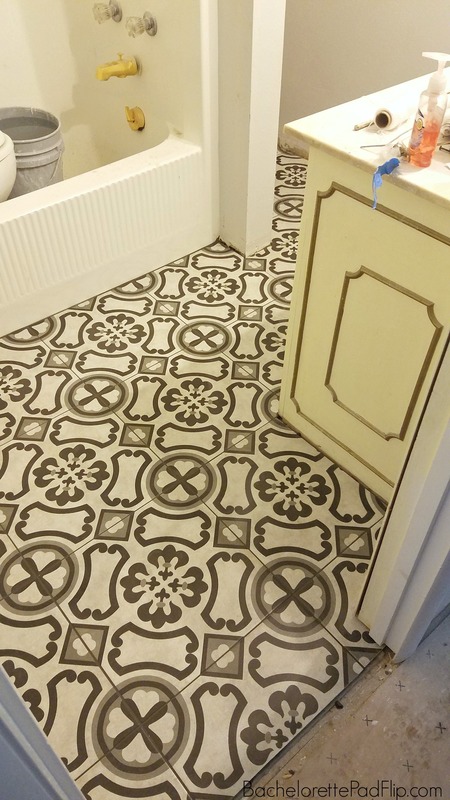 The Mexican tile craze had been swooning over design tile. Is it bold? yes. Is it risky? yes. Would I do it in a house I was going to live in for a while? No. But like I mentioned in my trends post, my goal is simply to capitalize on what increases my sellability and profits now. 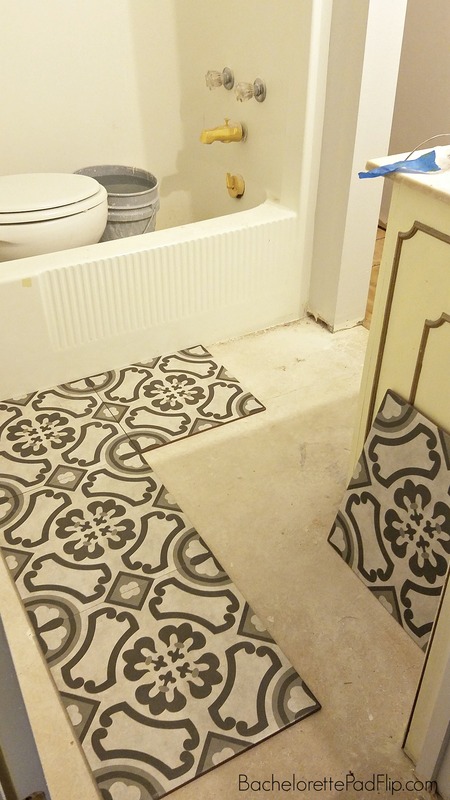 The cement tile that everyone is using comes at a heft price…one I wasn’t willing to pay. But I found the perfect alternative– variety of designs and great price point! I chose Interceramic’s Cementine tile in grays and blacks (but they have several designs with other colors). I didn’t find this tile at any of the big box stores, but I used a local flooring store to track it down. Once it was completely installed, I was so in love. I chose thin grout lines so as to not distract from the pattern. It looks remarkable in person, and I’m really happy I chose a high impact design for this little space. 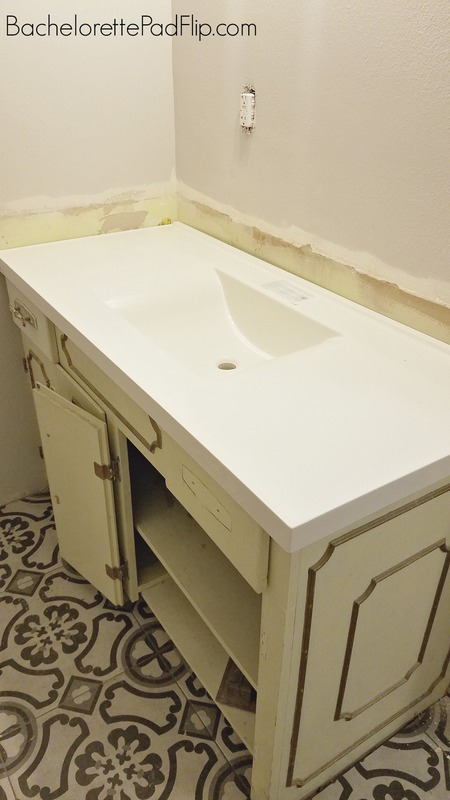 The next order of business was to ditch that dated marble countertop. Luckily, this cabinet was a standard size, so that meant I could purchase an in-stock countertop replacement. I chose one that had clean lines and a built-in sink. 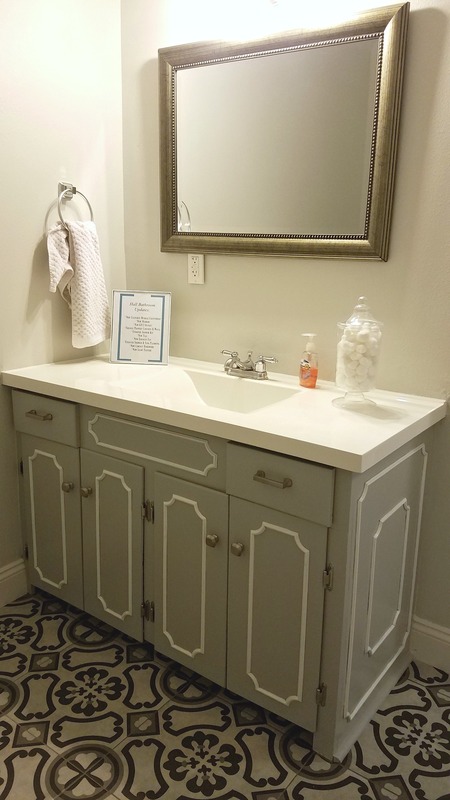 I actually salvaged the faucet and was able to re-use it in the same space. It did not take a lot of effort or money to update the cabinet. I’m sure many people would rip it out and just buy a pre-fab unit, but I think you lose all the character this original cabinet brings to the space. With a new countertop and paint, I was able to bring it back to life! I chose to paint the cabinet the same color as the kitchen cabinets, Benjamin Moore’s Coventry Gray. It’s absolutely beautiful and the perfect non-purple shade of gray. The original detail work got a fresh coat of bright white. I updated all of the hardware on the cabinet. I partnered with my favorite hardware company, D. Lawless Hardware, to modernize this cabinet. 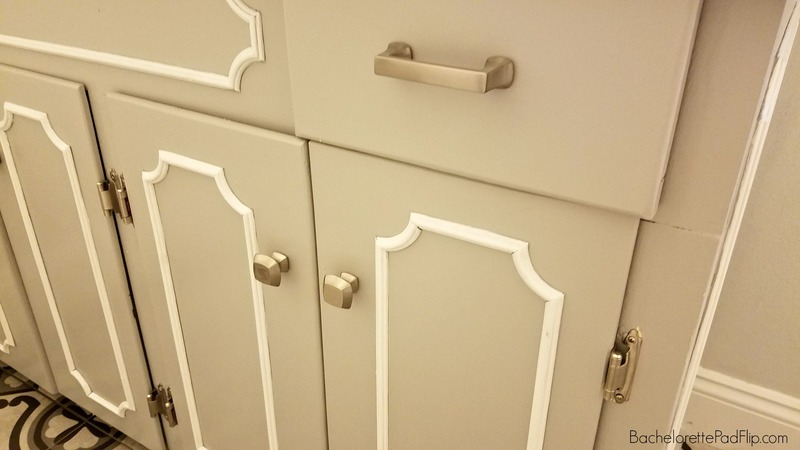 I chose a satin nickel finish in the Mandara 3″ cabinet pull and the Mandara knob. I loved the modern lines they have, and they were the perfect accent! Since I wanted a cohesive look, I swapped out the hinges as well. I chose D. Lawless’ Offset 3/8″ Satin Nickel Self Closing Hinges. For me, find the right hinges is always so difficult…they either don’t match up, look weird, or cause the doors to bump into each other. But these were the perfect choice! For the mirror in this bathroom, I found it on clearance from Lowe’s for $15. It was missing the hanging bracket if you wanted to hang the mirror vertically. I didn’t. So it was perfect for me…and the perfect price! Honestly, with just some paint and a few finishing touches and tile, this room quickly became my favorite. Not a lot happened in this room (comparatively speaking), but I just love the design of it. The gray on gray is so on trend right now, and I love how all of the finishes came together! To finish off this room, I bought the most inexpensive light I could find at Lowe’s and swapped out the globes for some clear modern ones. I also updated the plumbing for the shower and swapped the gold (not brass!) shower kit for a more modern chrome one. One final detail I added was oversized trim and some quarter round to finish off the floors. 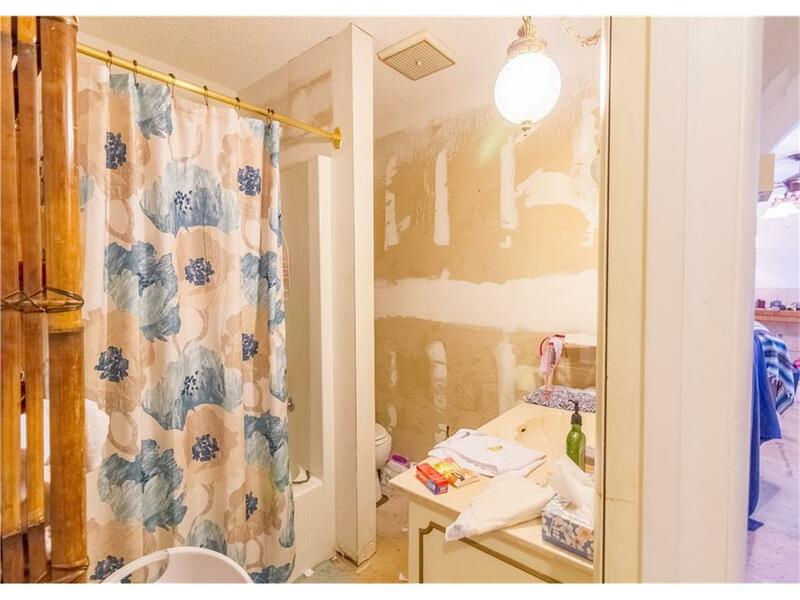 I probably spent no more than $1,000 in this room, but what a transformation for $1,000! I love that tile; it really makes a huge statement in updating the space. Everything works together and it all look wonderful. Perhaps your next career should be as a design consultant ! You’d never know this was a budget conscious redo – it’s spot on with today’s young buyers. Congrats on a job well done. Wow! Great job!! You gave me some great ideas! !